Discussion in 'Showing Your Herd' started by StrawberryOnion, Dec 17, 2018. You can milk them through. There is an alpine breeder here in NC that was showing does (and doing very well) with does milking through since spring 2016. What breed of goat do you have? What freshening? Some goats milk through without issue. Others will look "stale". We have several FF's that look great and have shown very well (one has 2 milking legs). I considered milking them trough, but I want another freshening to maximize their potential. After that I will probably milk them through. Thank you for replying, we currently own 6 alpine does from 8 month old - 5th frenshener. We are looking at getting La Mancha does though What do mean by "stale?" One of my biggest concerns was that the FF's udders wouldn't produce as much milk as say a 2nd or 3rd freshener. Also do you add anything in their diet to help with the continuous milk production or just treat them like you would if you tried them off? Greetings and welcome to BYH from NE TX! So glad you joined us. There's a wealth of info, knowledge and experience shared in the multitude of threads. Browse around and see what interesting stuff you can find. You'll get to "meet" folks at the same time. By all means post away when the desire strikes you, especially if you have questions (provide as much detail/info as possible and pictures truly help)... With all the great folks here, generally someone will respond in no time at all. Oh, and we all love pics, so post them anytime you feel the need! Please make yourself at home! @StrawberryOnion sorry for not responding back. We have been having internet issues. If you are wanting to milk them through, feed them like you would milking does. Do you know if your does are capable of milking through with ease? What does the breeder of your does think? 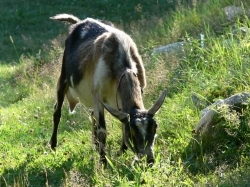 I have a goat friend that milked her Alpines through for 4 years. Does that in late lactation can look stale- they aren’t making as much milk, udder starts to shrink, don’t have the capacity etc. It can be harder to get a nice fill on them. Depending on what they are producing, if you have to do a 24 hour fill, it can signal the doe to dry up altogether. It really just depends on your goats. As I said before, next year we are probably going to milk some of our does through. We show Lamanchas, Nigerians, and recorded grades. Not a problem, I understand. I paid a visit to the breeder I bought my first couple Alpine does from and she was saying how a lady down in North Dakota bought a couple does from her and milked through hers just fine! The breeder told me that when she bred Nigoras she milked through those ones Come February I will definitely have to experiment with my girls, Thank you for responding again btw. I don't show but -- I've had Saanens milk thru well. In fact, it was difficult to get one doe to dry up! You do have to keep them well fed. They say it takes more for the doe to milk than carry kids. I can see that. Mine are all dried off now but it is my intention to milk two thru next winter vice dry off. Skip a year of breeding on them. There's no rule against it with ADGA and we've done it with several goats who have done very well. Some does just won't stay in milk well that long (we have a Nigerian like that) and others thrive on milking over a year. We milked a Lamancha FF that had tremendous production through for 18 months. We're currently milking a Saanen FF who kidded in Nov 2017. Her production has gone back up now that all our other does are in milk. Must be in the air. LOL. We kid most of our full size does in Dec-Feb and show at a few shows in October/Nov. Since we can't usually get them bred to be fresh in the fall we keep a few in milk to show and keep a steady supply for our year around customers. The Saanen was a good choice because there aren't a lot of them showing here so we make $$ for feed that way AND shes really easy to milk. We also don't own a Saanen buck so when she didn't get bred to kid by Feb we just decided to keep milking her. Get to know your does and you will know after milking for a year which ones are good candidates for milking through. We have some that are show stoppers but by 8 months in milk are ready to be done. Others would milk for years happily.